The best match of this weird World Cup had to be ruined somehow, as Stephane Lannoy continued to poor French showing in South Africa with very poor officiating, allowing Luis Fabiano’s goal to stand, despite seemingly knowing he used his hand. Later on letting the Ivorians go wild on the legs of the Brazilians without any red cards, but sent off Kaka for his needless elbow. Earlier it was Paraguay with a solid 2-0 win over a very weak Slovakia side and Italy continued to shame their World Cup trophy with an awful 1-1 draw with New Zealand, an historically bad result for Lippi’s team, deep in trouble, much like England. Very similar to the Uruguayans, Paraguay have a strong side, with some very talented front men and a solid defensive midfield and back, but play very conservatively, making it very hard to surprise them. Slovakia’s slow and boring style was not match for the South American efficiency, with Enrique Vera scoring in the first half and Cristian Riveros finishing the job in the 86th minute. Paraguay won’t mess up against New Zealand (just a gut feeling) while Slovakia face Italy needing a win to qualify. Lippi, like Capello, is in deep trouble. Italy played worst than they did against Paraguay, going behind early to Shane Smeltz’ goal, despite him being offside and a foul on Gilardino (maybe the worst player in this World Cup so far). Again, Lippi decided to go with the wrong starters, but despite his substitutions at half time, Italy never broke down the Kiwi’s defense except for that penalty kick, converted by Iaquinta, as Mark Paston was fantastic in New Zealand’s goal. Italy can still qualify with a draw against Slovakia if Paraguay beat New Zealand, but they have bigger troubles, concerning their horrible play and maybe the lack of a future Italian generation. A boring first half was upstaged by a fantastic second one. Luis Fabiano scored through a powerful shot in the first half, but both teams were far from impressive, as Brazil just couldn’t get possession and the Ivorians just couldn’t get any decent shots at Cesar’s goal. Second half? Different story – Melo and Silva took over the middle, allowing Kaka much more freedom to operate and work everybody else. Fabiano scored the second, which looked like a wonder goal at first sight, but pure cheating after the replay. The referee seemed to be in on it as later replays showed. Very troubling indeed. Elano added the third as Brazil seemed to en route to a very convincing win before the Ivorians started chopping legs, sending Elano out and not going easy on Kaka, Bastos and Dani Alves. The ref didn’t send anyone off, so Kaka did a little payback of his own, finding himself sent off. Drogba made it interesting, making it 3-1. Paraguay – Not surprised at all by the Paraguayans, who Peter picked to top the group. A little less selfishness by their forwards could have resulted in a much more impressive win but still, looked solid and tough, like expected. Only need a draw against New Zealand to qualify, but despite the All-White’s surprising results, I can’t see them dropping points there. Slovakia – Didn’t show up. They have talent, which they showed against New Zealand, but maybe the shocking draw there knocked the wind out of Weiss’s men, without anyone playing anything close to a decent offensive game. Have a battle with Italy, and Slovakia have to win. Italy are weaker than ever, but still, Slovakia just seem to slow and lacking purpose to pose any real threat. Italy – Where to begin? The goal they conceded should have been disallowed, but Lippi is making the same mistakes over and over again. Camoranesi should start, Gilardino shouldn’t, and maybe it’s time for Pirlo to make an appearance. Italy just lack any kind of sophistication and creativity most of the time, without off the ball movement and clever double-pass plays, they’re at risk of not going through the group. New Zealand – Two matches and still no loss – Ricky Herbert’s squad is defying the odds and have a small chance, if they stun Paraguay, to qualify from the group. Doesn’t matter what happens next, they’ve made history with today’s draw. Brazil – Something clicked for Brazil in the second half, and when they turn it on, there’s nobody better. 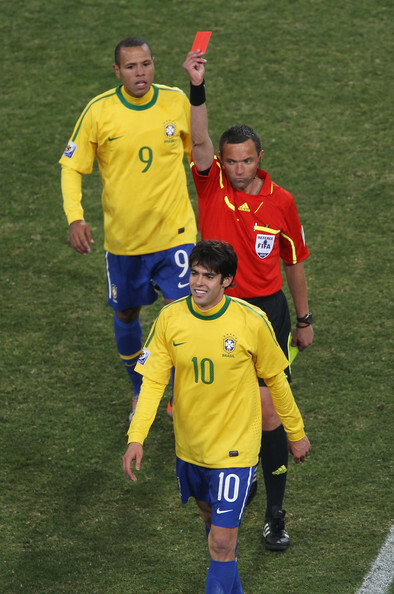 Melo and Gilberto Silva took over in the second half, and that’s the key in order to let Kaka start running the show. Maybe Dani Alves should get a chance to start instead of Robinho who really looked off today. Ivory Coast – Talented group, but with an injured Drogba and a nobody at the sidelines “un-coaching” the team, they didn’t stand a chance. Even when they controlled the game in parts of the first half, just didn’t look dangerous. Need a North Korean miracle to keep their hopes alive. Portugal – North Korea – After England and Italy, anything is possible. Despite the clear advantage the Portuguese have, no one will be surprised if the tough Koreans get a point. After all, Ronaldo didn’t seem to be handling the pressure to well in game 1. Chile – Switzerland – The battle for the top of the group – the technical Chileans against the organized and tough Swiss. Very tough one to call – Switzerland have yet to beat a South American rival at the World Cup, and I do prefer technical sides. Chile also learned from Spain’s loss I believe, and Switzerland will probably be a bit more open against the South Americans. Spain – Honduras – Another upset? Can’t see it. Spain are just too good to not go through, and a big win over the Hondurans, the weakest team in South Africa, could be a great start on their way back to the top of the group. Just don’t forget to start with Torres. Last – Goal count: 57 Goals, 29 Matches. Good day, 1.97 is looking much better.